Antique glass paperweights are a beautiful example of glass art from a bygone era. Believe it or not some of these paperweights can command hundreds and even thousands of dollars at auction. As the industrial revolution moved into full swing there was a need for a way to hold down all of the bills, letters, and other papers that littered the desks of the executives of the time. With no air conditioning windows were opened to allow the breeze to cool the offices in the summertime. However welcome the air flow was to the person working it was not good for a tidy office. The gusts would send papers flying in all directions. In order to combat this and still stay cool people used heavy items to hold the papers in place. In the 1840s glass factories in France began to enclose decorative items in glass spheres and sell them as beautiful paperweights. Bohemian - These weights were popular among the Victorians and were cut spheres of ruby glass. Crown - Twisted ribbons of color and lace radiate from the crown to the base. Lampwork - Lampwork paperweights have objects like flowers or butterflies made out of colored glass surrounded by the clear glass dome. Millefiori - These contain cross sections of tiny, multicolored rods put together to resemble flowers. Sulfide - Popular during the Classic period these paperweights have a cameo-like portrait in the dome. Swirl or Ribbon - Opaque rods or bands of up to three colors decorate the inside of the dome. Victorian - Dome glass paperweights with advertisements or portraits inside of them. The portraits were pictures of people which had been reproduced on milk glass and centered in the glass dome. This process was also used to produce advertising weights that had the name of a business or product. Most collectors agree that there are three separate periods in the evolution of glass paperweights. The first two can be said to contain antique glass paperweights while the third would contain only vintage ones. This period began in the 1880s and ran through World War II. Large glass companies were in decline but small artisans and family owned companies multiplied. Powdered glass was used to make decorations for the paperweights for the first time. Contemporary glass paperweights are categorized as weights made after World War II. Charles Kazium used new techniques to create traditional paperweights. Also during this time studio glass paperweights created by one artist in a studio grew in popularity due to their unique style. Most collectors fall into one of four categories. Type Collections - Accumulating the best example you can find of each style of paperweight. 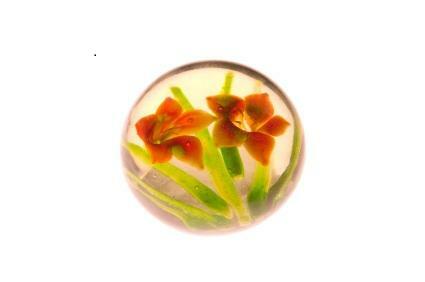 Theme Collections - Collecting glass paperweights with a common theme such as a certain flower. One Type - This collection will be made up of many examples of a single type of paperweight. Casual - The casual collector will choose paperweights that he likes no matter what the style or theme is. You may not be able to find many paperweights in the local antique stores but you can often find them at special auctions as well as online venues. A Google search will be helpful in finding these beautiful antiques. Collecting antique paperweights is a great hobby and a wonderful way to preserve a unique art form.